Each player takes the role of a meddlesome god, like the Greek gods in myths, playing with the lives of some foolish mortals. Pick a goal: Before play begins, pick a goal for the round. Each player will invent and describe a person. You want to invent someone who best reflects your spread of cards while best exemplifying the goal. The person who is in the best situation. The person you'd most like to be. The person you would most like to meet. The person you would most like to have be very far away. They're a dumpster fire of mythic proportions. The person whose situation makes the best story. You'd totally read that book or see that movie. 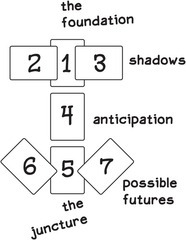 Deal cards: Shuffle the deck (A,2-9, , , ). Each player deals out cards following the Anchor spread (shown on the right). Then each player is dealt a hand of 4 cards. In turn order, players take turns playing one card from their hand. Your card covers one of the cards in someone's spread, either your own or another players. Your new card must share at least one suit with the card that you are replacing. You may not replace first card (the Foundation) or the fifth card (the Juncture); these are the cards that have other cards laid partly over them. After everyone has played all of the cards in their hand, players read the spreads. 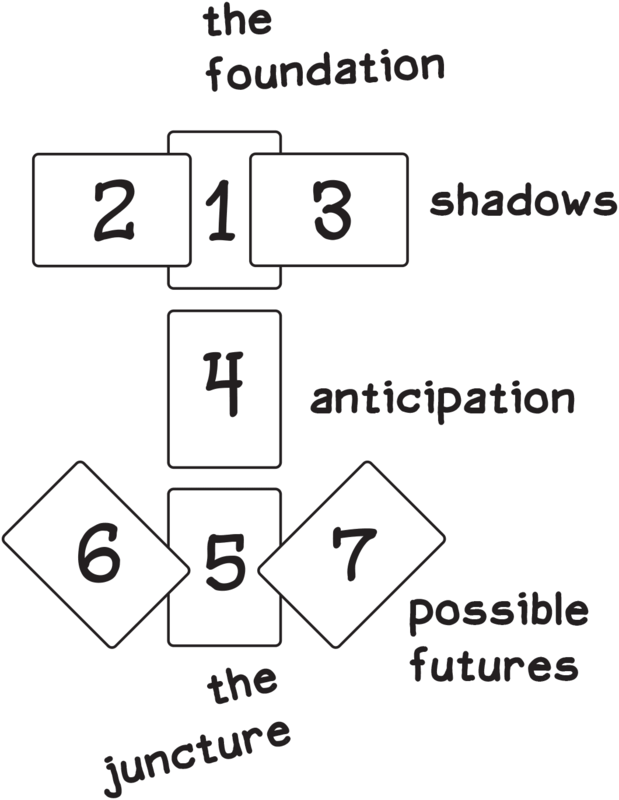 In player order, each player provides a reading of the spread in front of them. The goal is to invent the person described by this arrangement of cards. Who are they? What do they want? Where are they headed? 1. The Foundation: This is either the person or a matter of importance to them. 2,3. Shadows: These are obstacles or influences. 4. Anticipation: This represents a hope or fear about what's in store. 5. The juncture: This represents a choice, possibility, or danger. 6,7. Possible futures: These represent two alternative resolutions of the juncture. You can give your person a name (like "Don") or just describe them in general terms (like "a country gentleman no longer young"). The person can live in the real world or in a fictional one. They can live in the past, present, or future. Other players can ask questions about the person or not, depending on how interactive you want the game to be. Maybe each other player, clockwise around the table, may ask you one question about your person. After all the players have provided a reading, players simultaneously select which other player's person they think best achieves the goal while also reflecting their cards. You score one point for each player who selected you. Of course, some players will provide a reading that's inconsistent with or unconnected to what is in the cards. If you think another player has done that, don't vote for them. The rules given above really only work with 4 players. With 2 or 3 players, the scoring system breaks down. With 5 players, there aren't enough cards. Here's a variant which works if you're willing to play one round per player: With 3 or 5 players, one player each round acts as the judge. At the beginning of the round, the judge decides what the goal will be. The other players then play. The judge decides who wins the round. With 3 players, the winner scores one point. With 5 players, the judge gives out two points to the best and one point to the second-best. With 2 players, this is more of a pasttime than a game. But it is on the cusp of that even with more players.